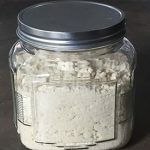 Homemade Baking Mix Recipe - A Substitute For 'Bisquick"
I have to admit, growing up, I had no idea that you could make your own baking mix. 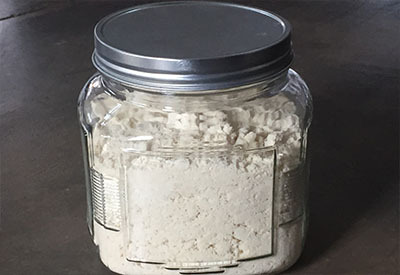 Homemade baking mix stored in an air-tight container. I never saw the need to because we always had a box of Bisquick in our kitchen pantry. Mom would pull it out and make the best pancakes, waffles, biscuits and even dumplings with the ingredients in that magical yellow box. As like most children do, I followed in the footsteps of my parents and purchased and used it just like they did. That was until I unfortunately ran out in the middle of making dinner. I was making a casserole that called for a Bisquick topping. I didn’t have time to run to the store so I turned the box over and looked at the Ingredients. Wow! Was I shocked that there were so many ingredients listed. 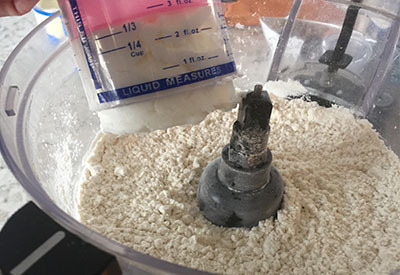 I sorted through what I had on hand and with just 5 common ingredients, I had made my own baking mix! My first attempt I used butter instead of shortening. That required me to keep the baking mix in the refrigerator or freezer. That worked for awhile, but my space was limited. So I switched to using shortening in this recipe so that it could be stored in my pantry instead. I put it in an air-tight container and whenever a recipe calls for ‘Bisquick’ I use my own baking mix with a 1:1 ratio. And for a healthier version – use coconut oil instead of shortening! Best part of all is that it can be made in minutes with your food processor. Just pulse the ingredients together and you are all done! 1. In a large bowl or food processor, blend together the dry ingredients. 2. With a pastry cutter or in your food processor, cut in the vegetable shortening until it looks like small crumbs. **For a healthier version replace shortening with Coconut Oil. Use this easy to make baking mix in recipes that call for ‘Bisquick’. Substitute in a 1:1 ratio. In a large bowl or food processor pulse together the dry ingredients. In your food processor or with a pastry cutter, cut in the shortening until it resembles small crumbs. oldworldgardenfarms February 22, 2018 August 31, 2018 Breakfast Recipes, Recipes, Sauces Dressing Jams Misc. ← One Big Day Today! – Can You Please Help Us With A Dream? Yes, you can find a Make A Mix book on Amazon. It comes in 3 forms: Kindle, Hard Cover or Paperback. Thank you for this recipe. The new Bisquick is not like it used to be and really leaves an awful chemical taste in your mouth. Not good!!! I have been using a home-made version for years, with coconut oil instead of shortening (as mentioned above, it is not so good for us. Much healthier than all those ingredients in Bisquick. Nice job!! Hi Diane the 1:1 ratio is meant to substitute homemade baking mix for the same amount that a recipe calls for Bisquick. So if the recipe calls for 1 cup of Bisquick, you would use 1 cup of the homemade baking mix. Hope that helps! One commenter spoke of the Make A Mix books, which are now out of print. I got one of the first editions online. Then a newer version, online, as well, followed by the Low-Fat-crazed edition, which I gave to my daughter. This was a number of years ago. I consider the books to be a treasure! Look online for them, perhaps Amazon. The authors are three sisters: Karine Eliason, nevada Harward & Madeline Westover. (yes, those spellings are correct.) You’ll find a total of 67 easy recipes for Dry Mixes, Semi-dry mixes that include some which should be refrigerated, (spice mixes are included in the dry mixes), and Freezer/ Refrigerator Mixes. Each mix has a variety of recipes to put those mixes to use included in the book. You will find their version of bisquick, as well as bread machine mixes, snack cake mixes, etc. As I said, these are treasures. Both the books I have are coming apart, as the newest one was printed in 1995, and the glue holding the pages in is coming undone. The VERY oldest one is needing to be pulled apart, put in page protectors and then stored in a binder. But NO one gets these books from me! Mary Hunt of “The Everyday Cheapskate” blog has a booklet out for sale that also has Make Your Own Mixes recipes. Those are available yet today, and probably much cheaper, but doesn’t include near the variety of recipes to put those mixes to use. Happy Mixing! I forgot to mention that it give you the recipe then it gives you a list of all the recipes in the book that use it. I have one, it I called “Make-A-Mix”over 300 recipe for every meal of the day…by Karine Eliason, Nevada Harward & Madeline Westover…some are for freezer meals also as well as dry mixes..I love it! I’ve substituted coconut oil for the fat in my biscuit recipe before with excellent results. Probably the lightest biscuits I’ve ever made. I am not sure. I would think you could substitute coconut oil instead??? Maybe when I make my next batch I will try it! That sounds incredible Cindy! I haven’t seen any of those cookbooks, but what a great treasure to have! Hi Dave….the organic shortening is not a recipe, just a suggestion that you could use organic shortening. Sorry for any confusion. especially in pancakes. I would suggest not using shortening, like Crisco, because it is very unhealthy and made with hydrogenated fats and has a list of ingredients far worse than the original Bisquick mix you are replacing. My mom had a series of “Make a Mix” cookbooks way back in the 80’s. She used them all the time. Our pantry was filled with mixes she created for a variety of things. I wonder if it would be possible to use coconut oil instead of shortening. Do you know?